The Heeled Regina Boots by Fairfax and Favor are knee length Portuguese riding boots handmade and crafted from supple leather. 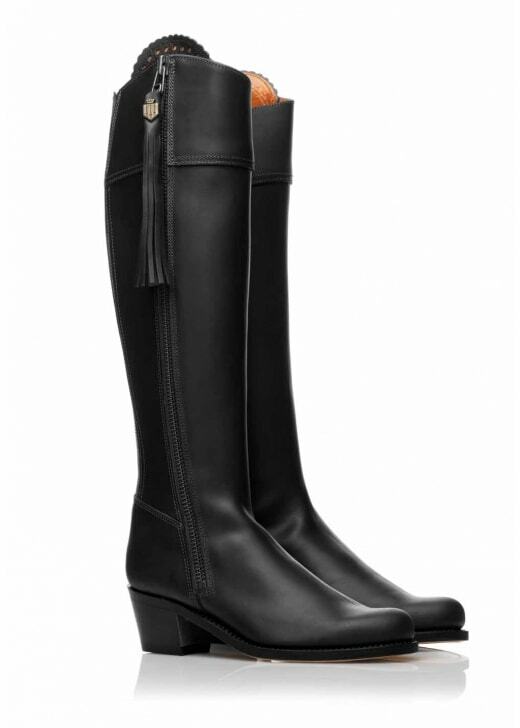 The Heeled Regina Boots by Fairfax and Favor are knee length Portuguese riding boots with a 5cm heel, handmade and crafted from supple leather. They feature a 6cm elasticated stretch panel to achieve the perfect tailored fit and a memory foam insole which compliments the leather/rubber composite sole for ultimate comfort. Showing our 1 review for Fairfax and Favor Leather Regina Heeled Boots (Rubber Sole). I wore these all day at Cheltenham and they were really comfortable. Very stylish boots but also very well made, comfortable and functional. Would definitely recommend.